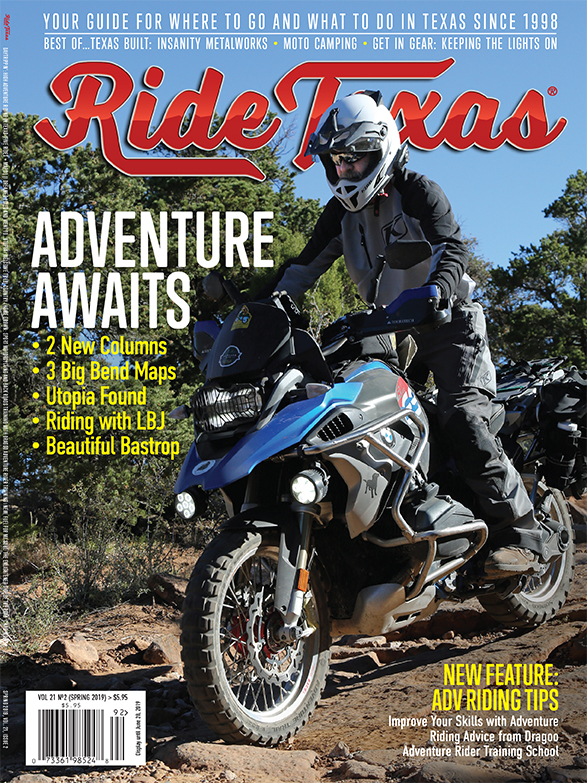 Texans know that we have some of the best year-round riding to be found anywhere, with our miles of two-lane highways packed with exciting turns and stunning vistas. We also know that it gets hot out there in the summer, so we’re offering you a timely list of some great spots across the state where you can strip off the leathers and take a leap—or a cannonball, or a belly flop, just not a highside—into cool water after your long, hot ride. So pull on some Kevlar swimming gear under your two-piece, throw a towel and maybe a magazine (we can think of a good one) into your saddlebags, and prepare to have your core temperature lowered . . . if only until you get back on the bike. The San Solomon Springs push out 22 million to 28 million gallons a day at Balmorhea, and the resulting oasis is an essential stop on the long ride out to West Texas. The huge L-shaped pool (1.75 acres!) has plenty of room for the bales of turtles, schools of small fish, thronglets of children, and gaggles of scuba divers that gather in, around, and under the water. Earn your patch with a plunge off the high-diving board. The hole’s strange name was derived by combining the names of Messrs. Balcum, Moore, and Rhea, the gentlemen who developed the land, in 1906. If you’re hungry: homemade burritos at Balmorhea Grocery. Off I-10, on TX Hwy. 17 S. just past Balmorhea. Open daily, 8 a.m.–6 p.m. $7 per person. 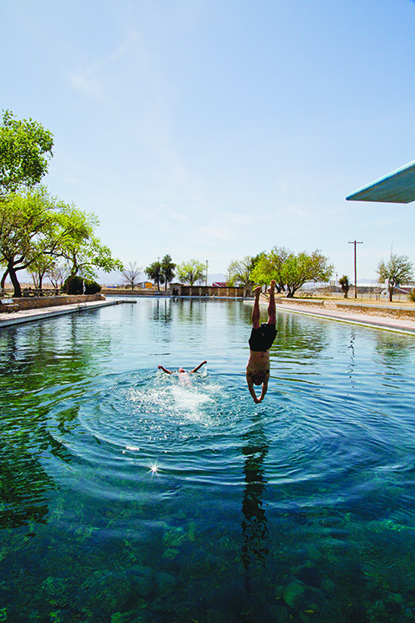 Take the plunge: Texans know that the best way to get into a natural spring-fed pool like Balmorhea is to just dive in. The cute square with its antiques shops and restaurants is a popular destination for riders and cagers alike, but you can make the most of this lovely little town with a visit to the state park, just a couple of blocks away. Oaks, cypresses, and pecans shade the ducks and the fishermen whiling the hours away on the grassy banks of the river. Two small dams create wide lagoons for sitting or swimming, and there are shelters outfitted with grills if you want to cook out. This little city park (that’s what it is, despite being in the state parks system) has a perfect small-town-Texas feel. A tip: Bring your Texas State Parks Pass, and take your after-lunch stroll through Bindseil Park—at the southeastern end of the square—to the park’s secret entrance. If you’re hungry: axis burger at the Redbud Cafe. 101 Park Rd. 23. 830-833-4333. Open daily. $4 per person. 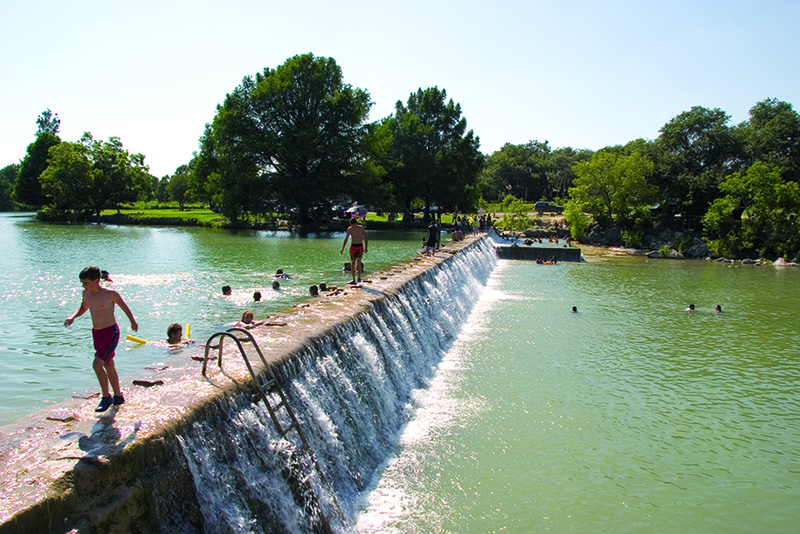 Two small dams create wide lagoons for sitting or swimming at this small city park in Blanco. Open Memorial Day through Labor Day, 10 a.m.–6 p.m. $9. This superb spot has many claims to being the top roadside swimming hole in Texas. Pull over just before the bridge, and walk across the large area of ridged limestone rock and through a little wood to find a sandy beach right at the spot where Turtle Creek flows into the Guadalupe. The water here is deep and cool, and the riverbank is shady, thanks to the tall trees. The place is a hidden Hill Country gem, and the only change I’ve noticed in the past few years is the welcome addition of a trash can by the bridge. Use it, folks! If you’re hungry: bring a picnic. Where Center Point River Road crosses the Guadalupe River (1.6 miles from TX Hwy. 173). Free. A few hundred yards along River Road off Texas Highway 55 there is plenty of room for bikers to pull over and park by the Nueces. No frills here, just cold, clear water deep enough to dive into, if you want to earn a patch—15 feet deep, in fact, which accounts for the moniker. I spent a happy half hour at this spot—also known to locals by the less evocative tag “the Swim Hole”—and a couple of empty beer cans suggested I was not the first. If you’re hungry: cheese and beef enchiladas at Casa Sifuentes. Half a mile west of TX Hwy. 55 on River Road, opposite Rocky River Camp. Free. Las Moras Springs, named by Spanish explorers (moras means “blackberries”), was the local spot for rest and relaxation for some 12,000 years before Fort Clark was built along the creek in 1852. The old fort is now a gated residential community with a golf course and a motel, and it should be on your list of riding destinations. The adjacent pool—the third-largest spring-fed pool in Texas—is a serious rival to Balmorhea for the title of Best in the West, and may be the main factor in solving the age-old “I-10 versus Highway 90” quandary. If you’re the sort who always picks I-10, take the low road next time and spend a night in Brackettville. Warning: The swimming pool is open only to motel guests or those signed in by a guest. If you’re hungry: hot dogs at Brackett Burger & Shake. Just south of U.S. 90 on Fort Clark Rd. 830-563-2493. Open year-round. Free to motel guests (room rates start at $55). Lampasas perhaps isn’t the fi rst place you think of when planning a run, but combine a stop at these sulfurous waters (the less-famous sister to Barton Springs and Fort Clark Springs) with a visit to Colorado Bend State Park and you’ve got a great Texas day out. The town grew up around the springs, which were famous in the late 1800s as a health resort. Train travelers would be ferried by mule, one trolley carload at a time, from the station to the Park Hotel. The open-air swimming pool, always 69 degrees, was built in 1911, and gets its water straight from the ground. If you’re hungry: Jäger Schnitzel at Eve’s Café. Hancock Park, at the intersection of U.S. 281 S. and U.S. 190 (E.E. Jr. Ohnmeiss Dr.). 512-556-5172. Open June through Aug., Thu.–Sat., noon–7 p.m., Sun. 1–6 p.m. $3.50. Hunt is the gateway to the wild and remote western part of the Hill Country, as well as the point where the North Fork and the South Fork of the Guadalupe join, so after fi ghting your way through the construction along Texas Highway 39, you might want to make the most of the last chance for a dip before the sweaty ride over the rocky ridges between here and the Frio. Hunt Crossing itself is closed while work is being done on the bridge, but technically that’s the South Fork anyway, so the picnic area half a mile to the east along the highway is the easiest and first place to jump into the real Guadalupe. On a summer’s day the sounds of splashing and laughter blend with the rumble of traffi c on the bridge. (Other spots nearby: Kerrville-Schreiner Park and Louise Hays Park, in Kerrville; Ingram City Park, Ingram Dam, Johnson Creek Bridge, and Schumacher Crossing, all along Texas Highway 39 east of Hunt.) If you’re hungry: burgers at the Hunt Store. 0.6 miles east of Hunt at the picnic area where TX Hwy. 39 crosses the Guadalupe River. Free. Even from Amarillo it’s a long ride to this 700-acre county park—it’s closer to Oklahoma City than Dallas. But if you crave wide-open spaces and the feel of the wind in your hair and the sun on your back, you’ll want to experience a ride in the rolling grasslands around Canadian, Texas, up in the far north Panhandle. And when you are up there, you’ll want to stop in at this delightfully low-key getaway, a popular fishing and camping spot. There are the usual picnic tables and grills, but don’t pass up the opportunity to eat at the park’s Lobo Restaurant. Designated swimming areas are on the north side of the lake by the concrete dam. Like many places on this list, Lake Fryer has drawn people for thousands of years, from the Indians who built villages along the creek to the local families who have gathered here since the land was settled. If you’re hungry: burgers at the Lobo, and leave room for a treat from the bake shop (restaurant closed on Mondays). Six miles east of U.S. 83 on County Rd. U. 806-435-4559. Open year-round, camping permit required after 10 p.m. Free. From Conroe to Carthage, East Texas is a rider’s dream. Two-lane highways swoop over gentle roller coasters through towering pine forests. Rivers, brown with tannin, cut deep, secret channels through the woods, and the area is dotted with lakes large and small. This pretty little body of water, hiding in the tall trees, is fed by three creeks: Prairie Branch, Big Chinquapin, and Little Chinquapin, and was built in 1937 as a recreation destination. Fishing draws most people here, but swimmers and sunbathers have the use of a roped-off area with a sandy beach and a fl oating dock. The water is the color of iced tea. Lying on the dock, watching the morning sun sparkling on the surface, it’s hard to imagine anything much better, though you have to wonder whether the park’s alligators know that the rope means the swimming area is off -limits for them. If you’re hungry: Southern cooking at the Farmhouse Cafe in Huntsville. Hunstsville State Park, six miles southwest of Huntsville, off I-45 on Park Rd. 40. 936-295-5644. Open year-round, 7 a.m.-10 p.m. $5 per person. I have to say that I think Ratcliff Lake is the most beautiful place for a swim in East Texas, and, in an area full of lakes and rivers, that’s saying something. Deep in the Davy Crockett National Forest, this picturesque fi shing lake has a roped-off swimming area, and you can rent canoes and pedal boats. Why not set up camp here in the hardwood forest, and make it your base for exploring the highways and byways of the Piney Woods? It’s an unbeatable place for a weekend getaway. Should you wish to stretch your legs after a day on the bike, take a stroll along the famous Four C Trail, which starts here. If you’re hungry: bring a picnic. One mile east of Ratcliff on TX Hwy. 7. 936-655-2299. Open year-round, sunrise–10 p.m. $3 per vehicle. 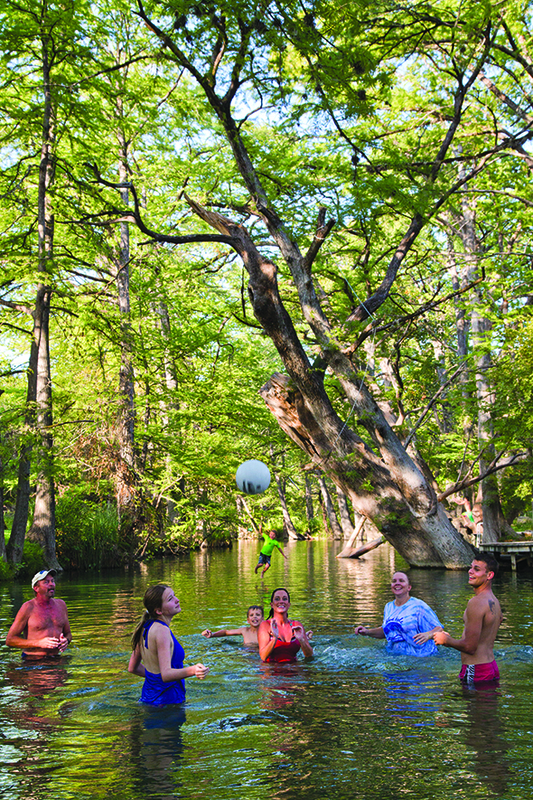 Turn north on Peaceful Valley Road on Texas Highway 16 just west of Bandera and pull over a few yards before the bridge to arrive at the second-best roadside swimming hole in the state, allowing that Brink’s is the best. Tall cypresses line the banks, sheltering the water, which is that steel blue–green color so particular to Hill Country streams. Below the crossing, the river flows around rocky shoals where you sit with your feet in the water and your hands holding a koozie. Before long you’ll be humming Tone-Lōc’s 1989 hit single “Funky Cold Medina,” if you remember it, even though that was a song about a love potion that worked on both women and dogs. See, I told you this place was magic. If you’re hungry: enchiladas in the John Wayne Room at the Old Spanish Trail Restaurant, Bandera. Six miles west of Bandera on TX Hwy. 16. Free. 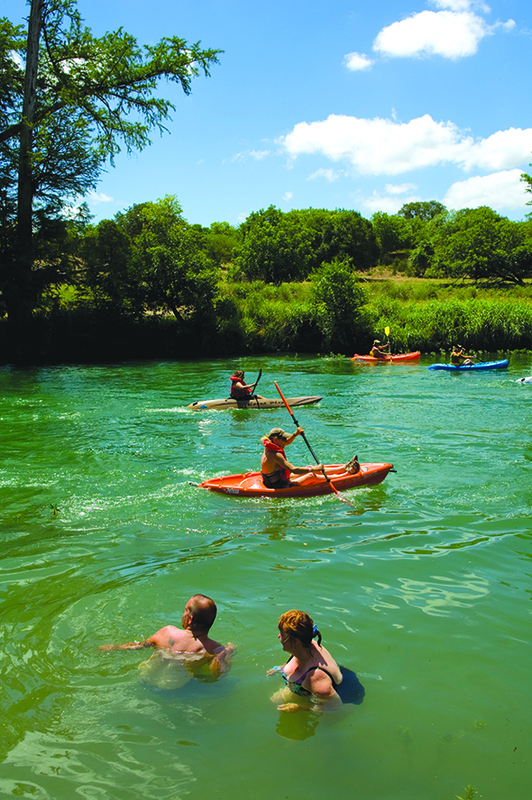 The distinctive steel blue–green waters of the Medina River near Bandera attract swimmers and kayakers alike. Ride west along the gentle curves of FM 2107 from Texas Highway 16 to the third crossing (just before Brewington Creek Road), where you’ll find this delightful swimming hole, a wide cypress-lined lake that’s shallow enough to wade around in and deep enough for swimming. Or just poke a toe into the shallows on the north side of the bridge. There’s plenty of parking in the big culvert on the western side of the river. If you’re hungry: bring a picnic. On FM 2107, 2.6 miles from TX Hwy. 16. Free. Two old dudes were sitting on a beat-up Dodge truck passing the time over Budweisers when I rode into this lovely little park by a small dam on the Sabinal River that makes a nice swimming lake. “You’ve come to the best part of the best part of Texas,” one of them told me, and on a sunny afternoon, I wasn’t about to doubt him. Huge cypress trees stand guard along the banks, and an oak motte shelters a number of camping and picnicking stations. This is one of several places along FM 187 that offer river access and riverside cabin rental or camping, but it’s the only place I found where you can rent a dance floor for $50 a day, so make it a riding club outing and have a party! If you’re hungry: the special at Lost Maples Cafe. West of FM 187, at the intersection of Houston (FM 1050) and Cypress. 830-966-3643. Open year-round, sunrise to sunset. $5 per vehicle. Popular for good reason, these tried-and-true swimming holes should already be on your list. Still the jewel in the city’s violet crown, and the best swimming hole in Texas, bar none. Ride the chute on the Comal and then escape to Cypress Bend. Waterfalls and rope swings await you at this stone Texas classic. A playground for serious kayakers, though there’s room for tubers and spectators, of course.